“All (on the up and) Up” is what we expect from our accountants and seems to be the message of this handsome addition to the Bear Fever collection. 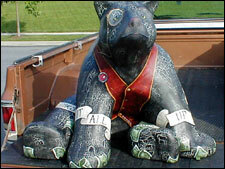 The Accountant Bear sits proudly on the back of Paul Stahl’s 1979 Chevy pick up truck, fondly known as the “DaDa Trk.” This shared bear is sponsored by six Boyertown-based accounting firms. 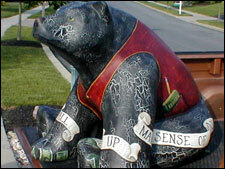 Bob McGee, a proud Boyertown graduate, utilized his signature “crackled” effect to create this stunning bear. 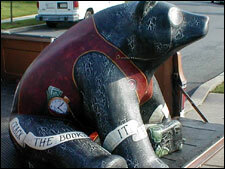 “Time is money.” Bob McGee helps remind us that old saying on the Accountant Bear. 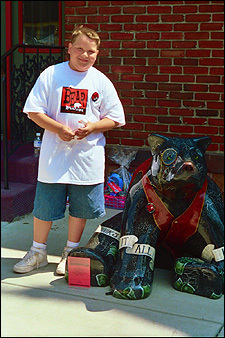 Ryan Haas volunteered his efforts in watching over the Bear Fever bears and assuming the customer service position for Bear Fever at the 2005 Sidewalk Sale. He was immediately awarded Bear Fever membership for his initiative. 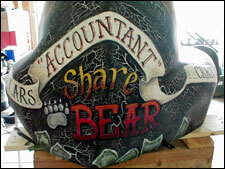 The Accountant Bear—still unnamed—is another of the Bear Fever shared bears. While interviewing the different accountants who responded to my calls, I was especially pleased to learn how much fun these men were. They were not stuffy and boring as I assumed most accountants to be. Instead, I found each of them all to be very charming and delightful interviews. “Simply unique” is the only way to describe Larry Hoffa, one of the sponsors of the Accountant Bear. He warmly ushered us into his, may I mention, cluttered conference room and entertained us with amusing stories. Mr. Hoffa shared that he felt treated as a foreigner when he first came to Boyertown; and while he joked about his competitors throughout the interview, expressing concern that the bear not be placed outside his competitors’ offices, I had the feeling that they were all friends who just don’t like to admit their fond feelings for one another. Mrs. Stahl recounted, for example, that of all the accountants contacted, Mr. Hoffa wrote out a check for his contribution during the initial interview—eager to “beat” his colleagues who’d “volunteered” him as a Bear Fever sponsor! Sounds like friendly rivalry to me. On our way out, we noticed a shiny new Mercedes convertible, in red, and I suggested to Mr. Hoffa that I might look better driving it than he. He laughed, smiled, and said with his typical wit, “At my age I would still look better in it than you. John H. Griesemer was another one of the charming accountants that I had the privilege to interview. It was apparent from the second I walked into his office that he was an outdoorsman. His walls featured different memorabilia from assorted hunting trips as well as pictures of the outdoors. We chatted for awhile about why he decided to participate in the Bear Fever project, but we really had the most fun talking about his retirement. Mr. Griesemer plans to retire to Mt. Charleston, Nevada, but—don’t worry, devoted clients—his retirement is at least 5 years away. His charisma inspired enthusiasm in me; he told countless stories of his different trips out to Mt. Charleston and why he had fallen in love with that part of the country. I was convinced that I’d love it there too. The third, and final, accountant I interviewed was Mr. Bob Reinhart of Reinhart and Company. My Bear Fever teammates credit Mr. Reinhart and his assistant Barb Akins for inspiring the “shared bear” concept last summer. Mr. Reinhart is a gentle and somewhat calmer man than the previous two gentlemen and spoke positively about his involvement with Bear Fever and of his experiences and career in Boyertown. He is obviously a devoted community leader who supports the efforts of others seeking to build a better Boyertown. Although I was not able to secure appointments with the other accountants involved in this Bear Fever Shared Bear, I’m hopeful that they will want to contribute information about themselves and their services so that we can add information about them to this website. Kindly feel free to call or e-mail Mrs. Stahl at 610-367-8066, janeEstahl@aol.com to set up an appointment. Bear Fever aims to be inclusive and responsive to the community in all aspects of the project. 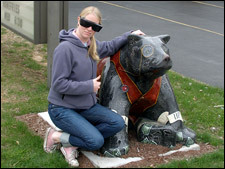 Our Accountant Shared Bear was sponsored by the following firms: Larry Hoffa of Larry E. Hoffa and Company, John H. Griesemer, Jr., Reinhart and Company, Chris and John Schlegel, Denny Urffer of Resnick/Amsterdam and Lesher, and Barry L. Weller. Bear Fever thanks all of our participating accounting firms for their support of this unique community art project. 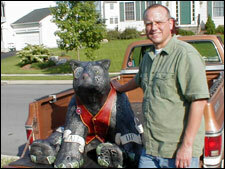 Bob McGee, the artist, was himself a graduate of Boyertown High School, eager to support the arts and the Bear Fever project. While he currently lives in Emmaus, Bob has many fond memories of BASH and wishes that a project of this nature had been available when he was a student. 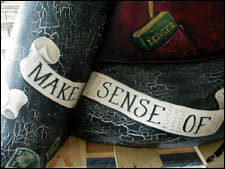 Bob’s involvement with the project came as a result of a chance meeting with Paul Stahl at a graduation party of one of Jane’s students in June 2004. 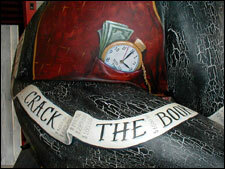 The “crackling” effect seen on the bear is a trademark of Bob’s work that Paul was eager for him to display.